Executive Mosaic is glad to recognize PV Puvvada, a senior vice president at Unisys and president of its federal systems business, as an inductee into the 2017 edition of the Wash100 — Executive Mosaic’s annual selection of influential leaders in the government contracting arena. The 25-year Unisys veteran and three-time Wash100 inductee manages the unit that works with federal agencies in technology areas such as cloud computing, unified communications, security, big data and mobile applications. Research firm IDC designated Unisys a “leader” among systems integrators in the federal market and recognized the company’s security and cloud offerings in an IDC MarketScape report published last year. Also in 2016, the contractor received Amazon Web Services’ Government Competency status for efforts to deliver products and services on the AWS cloud to federal, local and state government clients. Unisys opened an information technology service center in Augusta, Georgia, for its public and private sector customers last year and Puvvada said then the firm expects to increase IT talent pipeline over a five-year period. Puvvada also offered his perspective on the possible impacts of social media use in the government and the new administration’s hiring, economic, acquisition and cybersecurity initiatives on the federal IT community. “Many of the new leaders will come from outside of traditional government circles and must get used to the unique challenges involved in government work — while those who work in the agencies they lead must become acclimated to the new leadership,” he wrote in a guest piece for FCW. 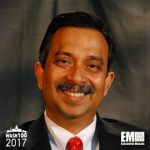 Puvvada was promoted to Unisys federal systems lead in February 2015 and is a member of the Professional Services Council’s board of directors.